Is it possible to set the default display brightness so you don't have to re-adjust it everytime you reboot? My laptop display is killing my eyes at the login screen already because it starts at 100% brightness every time. This works echo 5 > /sys/class/backlight/acpi_video0/brightness but does not play well with X. More specifically, X is not aware about your preferred settings and you may end up needing to set the brightness manually again at least once, similar to bug #1042359 . Solutions based on things like setpci -s 01:00.0 F4.B=50 are dangerous. There, 01:00.0 is actually an ID targeting a particular board on the PCI bus. And it is system-dependent. That means blindly following this may write configuration registers on some other boards where it may mean anything, from just nothing to crashing the system at some point in the future. Anyway it does not play well with X either. It only sets backlight when lightdm starts. But it can be combined with the /sys-based solution above if you really need to set backlight earlier. Copy-paste of these commands should do what you need (sudo will probably ask your password). Install xbacklight if it is not already installed (it is a small package). Try to figure out a suitable value for your hardware and lighting conditions. Create a small script running xbacklight. You can change the =30 into another value if you wish. The || true ensures that if xbacklight fails for any reason, X can still start. echo "xbacklight =30 || true"
Instruct lightdm to run the script when starting X. Specifically, this adds a line display-setup-script in a lightdm configuration file, but only if there is not one already. 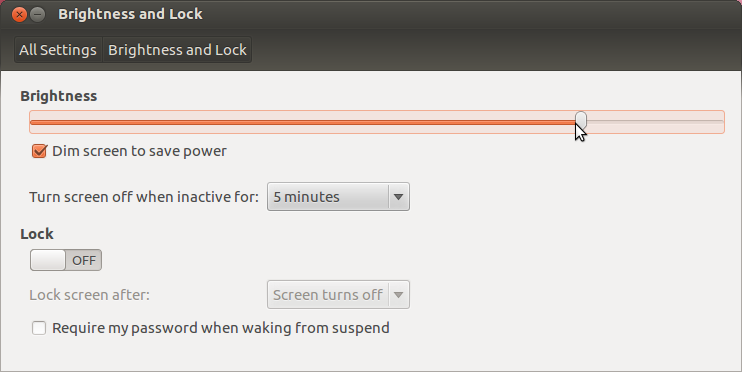 # Ubuntu 13.10 and above have lightdm.conf.d. 14.04 *only* has lightdm.conf.d. May be tested by restarting lightdm from a root session on the console. Or, more simply, by rebooting. Tested on Ubuntu 12.04, 12.10, 13.10, 14.04, 14.10, 16.04. Please provide feedback about your experience. Actually echoing some value to doesn't help in the brightness as the value will differ from system to system. First you need to set the brightness of the screen to the level comfortable to you, which can easily be done in System Settings → Brightness & Lock or by using the function keys. Now we need the same value as in the brightness every time we start our system. This can be done by changing every time the value in this folder at the startup. We need to change the rc.local file. Replace 900 with whatever value you need (that is, the value you got from the above procedure). Also replace intel_backlight with the folder name from /sys/class/backlight/. As an aside, I added the line rfkill block bluetooth to my rc.local file as I don't use Bluetooth at all but Ubuntu starts Bluetooth every time it reboots (even if the Bluetooth was off before). You can also add it, and just in case you want to use Bluetooth you can always start it again, even if this line is in your rc.local). Don't change the value of exit 0 in the ending. If that line doesn't exist, add it. Now even if you have restarted the system you will have the same value that you need. Be careful to not put a brightness value greater than max_brightness, as that will throw you an error saying that it is an invalid argument. Have you look at redshift? It's designed for another purpose (make the screen less bluish at night), but it might solve your problem as well. If you change brightness-day and brightness-night to a value you like and set temp-day and temp-night to the same value, you will effectively use redshift to set your brightness only. To make redshift autostart at login, select Applications/System tools/Preferences/Startup applications/Add. Name: redshift. Command: /usr/bin/redshift. Use the slider to adjust default setting. Not the answer you're looking for? Browse other questions tagged laptop brightness backlight xbacklight or ask your own question. How to save brightness settings? Where do I find display brightness controls in Lubuntu? How do I get brightness controls working on a Sony VAIO Fit 15E? How do I permanently change the brightness of the screen?